There were plenty of horrors faced by soldiers during World War II but nothing quite like this. Achtung! 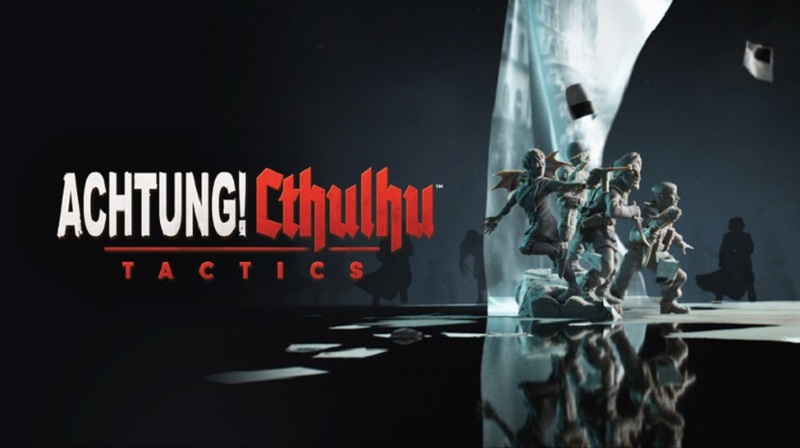 Cthulhu Tactics is a mix of Nazi blasting tactical warfare and the creeping dread of H.P.Lovecraft’s Old Ones, a sort of Saving Private Ryan From Unspeakable Horrors. Taking on the best traditions of the modern tactical turn-based shooter like X-Com, the game tasks you with leading Section M, the X-files of the Allied forces, against the Nazis and their new horrific chums. The game is actually derived from a well regarded tabletop board game, so it has a good background and this shows through in the wealth of material and the great art work throughout the game. One of the ways it encourages the feeling of dread so wonderfully conjured in Lovecraft’s stories is by using the age old ‘fog of war’ effect, which is called The Shroud here, to obscure the battlefield ahead of you. This both provides some jump scares from coming across a particularly nasty enemy and ups the difficulty in planning your next move, making you take chances on guiding your squad into unseen dangers while weighing up the ability to move back to a safe area at the first sign of danger. As any Lovecraft fan would expect, madness comes into play here, with Cthulhu and friends inflicting a growing malaise in the minds of those who would stop them. This features in the new points system, Momentum. which works alongside the more standard action points (those that let your character move and shoot) to provide special abilities, both with weapons and, later, with more supernatural powers. Sanity levels drop and affect both action points and momentum, causing negative reactions to both. It’s a nice touch that manages to inject some of those elements that made the stories of the Old Ones so powerful but it perhaps doesn’t go far enough in making the game stand out. While X-Com, rightly, has a good reputation as one of the best strategy games out there, Achtung! Cthulhu Tactics won’t be taking its crown any time soon. The gameplay is tight and focused, but progress is a little too slow and you don’t get the more juicy powers or the rather excellent set-pieces until late in the game. You also carry on with the same 4 members of Section M that you started with, there’s no permadeath here and it makes the risks slightly less risky as you’ll simply play through the same level again with the same people if you fail. It’s a shame because, generally, the game is well designed and fun to play. The Switch version is a little late, appearing after the PC and other console versions, but it’s a welcome addition to the eShop library as it’s very different from anything else there. It plays well and doesn’t suffer from any performance issues. The tactical gameplay and themes mean this is a much needed title on the system and the low price should encourage players who want something a little more strategic to play. While it has its faults, Achtung! Cthulhu Tactics is still worth a look for fans of both Lovecraft and turn-based combat. I’m really hoping for a sequel where some of the issues with pacing and progression can be addressed as the ideas behind the game offer a chance at something really special. As it stands, it’s still worth picking up as a decent turn-based strategy game with an interesting horror element.